Successfully Added Z28 Pro Android TV Box - 4K Support, Android 7.1, Bluetooth, Kodi TV, Google Play, Quad-Core CPU, 2GB RAM, WiFi to your Shopping Cart. 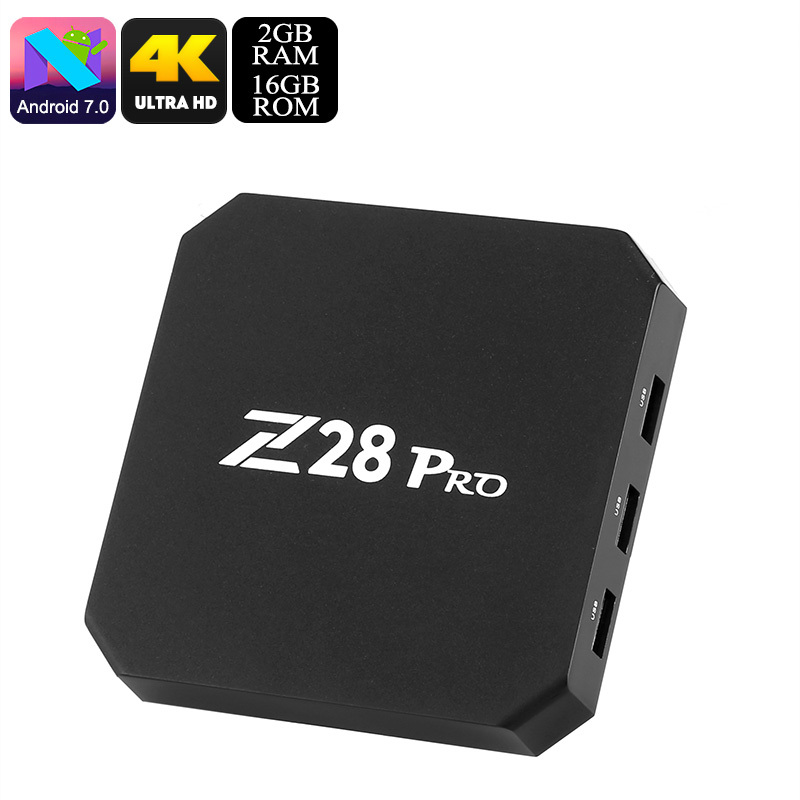 Bring hours worth of fun and entertainment into your household with the Z28 Pro Android TV Box. This Android Media Player lets you play games, watch movies, and use the latest Android Apps straight from your big screen TV. With its WiFi support, it even allows you to browse the web and stream or download media directly via the Play Store or Kodi TV. It comes with the latest Android 7.1 operating system. This makes it possible for you to use all the latest software features available. With this cool electronic gadget at home, you and your loved ones will never have to experience a moment of boredom again. Although small in size, the Android TV box packs some real power. It features a Quad-Core processor that comes along with 2GB RAM. Additionally, it also has 16GB internal storage and the ability to slide in a 64GB SD card. Therefore, you’ll never have to worry about running out of storage space for all your latest downloads. Whether you’re into games, movies, or Apps – The Z28 Pro Android TV Box handles it all. In order to treat you to the best imaginable visual experience, this Android media player supports 4K resolutions. From now on, you’ll be able to undergo a breathtaking media experience while watching your favorite sports games, movies, and series. Your 4K TV box furthermore supports Bluetooth. This feature brings along great efficiency for those of you that wish to use the gizmo along with other external devices such as a wireless keyboard or speaker. The Z28 Pro Android TV Box comes with a 12 months warranty, brought to you by the leader in electronic devices as well as wholesale Android media players..